For the last three and a half Billion years, evolution has built sensors. The nerves on your fingertips are just as good as any electronic touch sensor, a retina is able to detect a single photon, and the human ear is more finely tuned than the best microphones. At the 2016 Hackaday SuperConference, Dr. Christal Gordon, educator and engineer, talked about the hardware behind our wetware. While AI researchers are still wondering if they have to define consciousness, there’s still a lot that medicine, psychology, and neuroscience can teach us about building better hardware with simple tools, just like nature has been doing for Billions of years. This wristwatch is hiding a lot of features in its hardware and its software. It’s called the TicTocTrac and it’s a Senior project for a pair of students at Cornell University. Judging from the sheer volume and quality of the project documentation we wonder if someone has a science writing career ahead of them? Be we digress… It’s a clock and we love it! First off, this does more than just tell the time. In fact, that’s almost an ancillary function in this case. 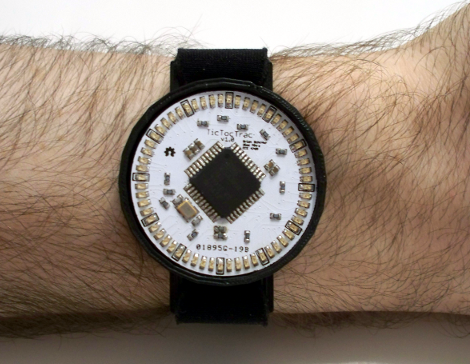 The wristwatch is more of a metering device to record your own time-based behaviors. Find yourself checking your watch frequently as the lunch break approaches? This watch records that activity and you can later graph the data. This allows you to analyze how you percieve the passage of time. The more often you check the time, the slower you feel time progressing. The documentation does a much better job of describing this than we have time for, so check it out. On the hardware side of things we’re quite impressed. The housing is 3D printed. It hides two half-circle PCBs below the full-circle PCB face plate. The half-boards leave space for a tiny rechargeable battery, and host a vibrating motor and RTC chip. Instead of using buttons, there’s a piezo sensor which detects when you tap on the top of the watch. Is your popped collar so epic it emulates horse blinders? Are punk teens always skitching your coattails? Are you constantly moonwalking into power poles, trash cans, and the elderly? [Paul Coudamy]’s Hard-Wear Jacket solves all of these problems. It has a micro-camera embedded in the back of the neck and streams live video to a sleeve mounted monitor. 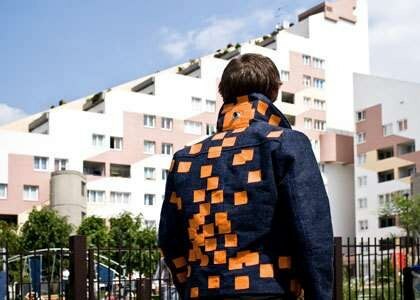 The goal is to expand the perception of the wearer and how they interact with the environment. We know this is just a small step and doubt many people will be scrambling to never turn their neck again. It’s something interesting to contemplate though: how will people behave when brain taps allow their peripheral vision to have the same clarity as normal vision?